The work we do requires E-N-E-R-G-Y and we recently realized that physically, there could be adverse negative effects on our awesome employees because they are sitting at their desks all day here at Swoon! So, as a part of our new wellness initiative, we have put entities in place to reassure wellness from physical, mental, environmental and emotional perspectives. This effort is to further the success and happiness of our hardworking Swooners as we want to continue to remain the employer of choice – continuously pushing boundaries. 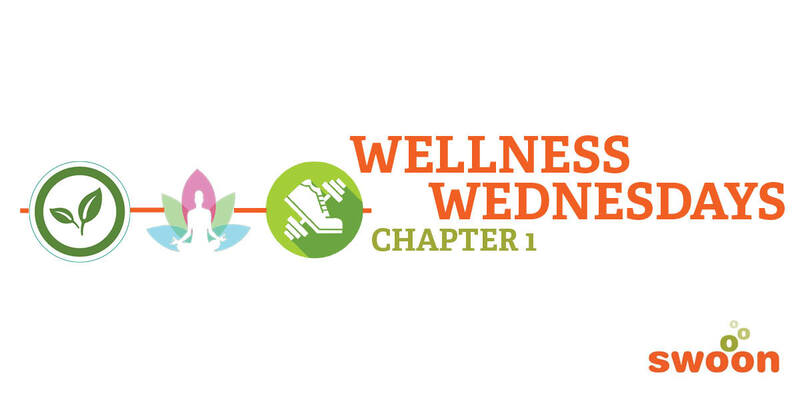 Our first wellness chapter focuses on discovering how physically, we can increase the wellness within our company. 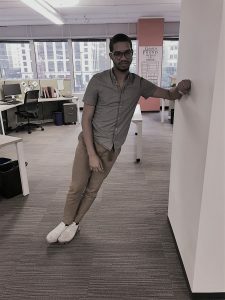 We conducted extensive research on how to create a foundation for wellness activities to take place in the office and discovered some…interesting information. A recent Forbes article shared that when corporate wellness programs first took off, the focus was mainly on, “smoking cessation (and) weight loss.” Now however, according to the article, physical wellness goals, are more focused towards developing the necessary stamina to handle daily work tasks. Therefore, once a day at the Swoon office, we attempt to have 5 to 10-minute intervals of stretching activities. We have also been fortunate to be within an infrastructure that has a fully-equipped gym that can be utilized throughout the day for physical advancements. According to Greatist.com, short bouts of aerobics, strength techniques and stretching in between work activities can tremendously help improve fitness levels and heart health. Although these little techniques will probably not prepare you for your marathon, over time, they will advance personal strength and stamina while presenting the opportunity to burn a couple extra calories too! The Casual Lean: Waiting in the hall for a meeting to start? This is the perfect time to nonchalantly work out the upper arms! Casually lean against the nearest wall, supporting your body with the forearm only. Now lean into the wall until the upper arm almost touches it, and then push back out. Repeat for 15 reps or until the meeting gets underway. 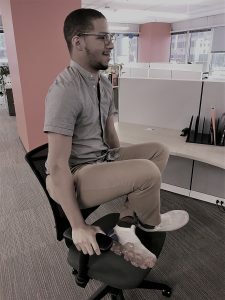 The Desk Chair Swivel: Lucky enough to have a fun swivel chair? Use its twirl to your advantage with this oblique abs fix. Sitting upright and with the feet hovering over the floor, hold the edge of your desk with your fingers and thumb. Next, use the core to swivel the chair from side to side. Swish back and forth for 15 rounds. The Fab Abs Squeeze: Another silent deskercise, this one can be covertly executed when walking down the hall or seated during a call. Simply take a deep breath and tighten the abdominal muscles, bringing them in towards the spine as you exhale. Stay squeezed for 5-10 seconds and release. Repeat for 12-15 reps. The Office Genie: Want to add a little magic to the workday? Raise the legs into a criss-cross applesauce position while seated in a chair. With your hands on the armrests, push upwards to raise the body off the seat and remain floating for 10-20 seconds. After granting a few wishes, release back down to the chair, rest for a minute, and repeat. Craving more magic? Try this balancing act while in a chair that spins. 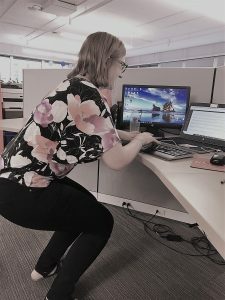 The Desk Squat: Mastered the art of standing around? Add a squat! Start standing with feet together (and the desk chair pushed out of the way). Bend the knees slightly so the thighs are almost parallel to the ground, as if sitting in a chair. As you bend, raise the arms straight up or towards the computer screen. Keep the knees together and aligned. Hold for 15 seconds and release. Repeat for 4-6 reps. Maintaining physical wellness is something that should be taken much more seriously in the workplace. Here at Swoon, we try to be ahead of the curve by furthering these initiatives. So far, we have seen great result and are look forward to even better ones in the near future! Be sure to check back next month for chapter 2 of our wellness series. How did you like the desk exercises? Be sure to engage with us on social media to learn about all things Swoon and to find out about blogs like this one!